What is Bluetooth Car Speakerphone? this device can be use as hands-free kit both in car or as conference speakerphone on desk when you are at home, office .ect. 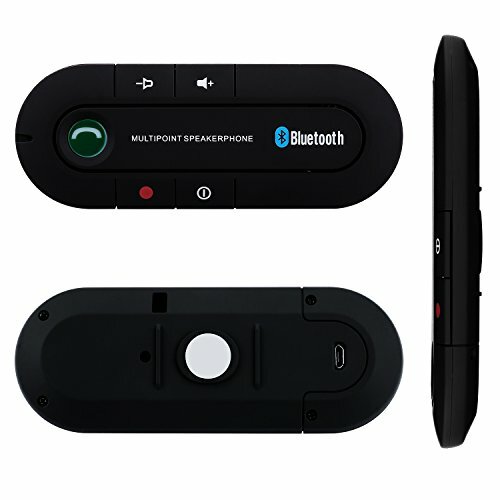 This Car Bluetooth Hands free Kit can make your life more fantastic. • Multiply function: Support Hands Free, SIRI, music and audio fiction. • It's strongly recommended to make it fully charged before using. • Easy to use. Just clip it on the sun visor of the car or anywhere to be clipped. We are a professional R&D company, focus to Bluetooth Car Speakerphone with good quality and reasonable price. We continue to research new design appearance and technology, committed to develop more worthy function. Your valuable suggestions and satisfaction is our motivation. 1. If you have any quality problem about our products, we could provide you 24 months cost-free warranty and 10 years free maintenance. 2. If there is any dissatisfaction with our products or have any questions, please let us know at the first time, we will definitely reply you in 8 hours. 3. If you are not satisfied, before you leave the Negative/Neutral feedback, please contact us and let us know that. We will try our best to solve the problem for you until you are satisfied. 4. We also could provide you 24 months cost free refund or replacement, we are always here for you! SAFE & EASY TO USE- Support for hands-free calls, keep your drive safe and Stay focused on the road ahead while enjoying hands free calls and control over your phone. Back clip design, stability, bring your life more conveniently. HIGH PERFORMANCE- Bluetooth V4.1+EDR,noise cancellation technology, low power consumption, superior performance. Enjoy clear calls and wonderful music. INTELLIGENT CONNECTION- You can connect 2 phones simultaneously through SIRI or bluetooth. Available for answering and receiving all calls with any bluetooth smartphone and iPhone. LONG STANDBY TIME- Charging time 2 hours, talk time up to 20 hours, long standby time. 100% SATISFACTION GUARANTEED- We could provide you 24 months cost-free warranty and 10 years free maintenance If you have any quality problem about our Bluetooth Phone Speaker. If there is any dissatisfaction after you received our products or have any questions, please let us know at the first time, we will definitely reply you in 8 hours and try our best to solve the problem for you until you are satisfied. We also could provide you 12 months cost free refund or replacement. If you have any questions about this product by BTBSZ, contact us by completing and submitting the form below. If you are looking for a specif part number, please include it with your message.